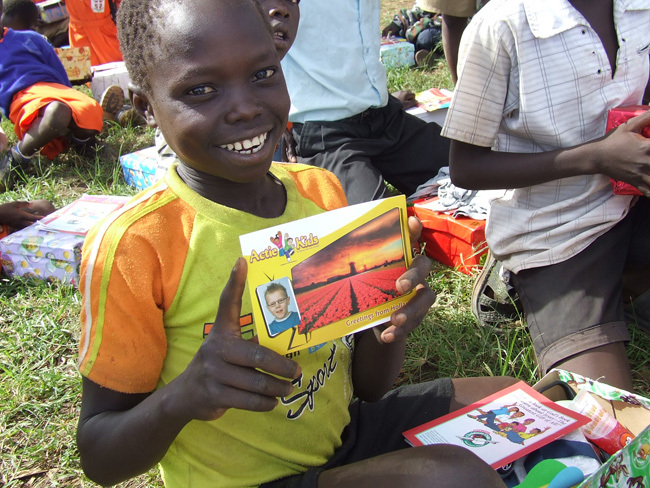 FILL A CHILD’S LIFE WITH JOY THIS CHRISTMAS! Last year we worked with Operation Christmas Child with the branch of Samaritan’s Purse based in Germany and were able to send more than 400 parcels. 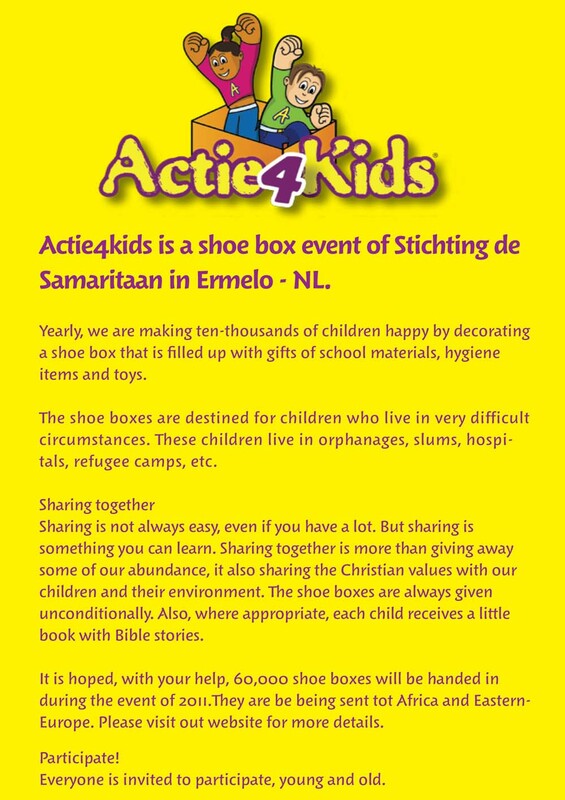 This year we are working with Actie4Kids, based in The Netherlands, who have a programme modeled on Operation Christmas Child. This is something for children and adults. If you are interested, you can participate singly, together with friends or you may like to organise a Church group or there may be an existing group that you can join. Leaflets and posters are available in Dutch and French as well as English. Please contact Heidi Bowcher for supply of these. 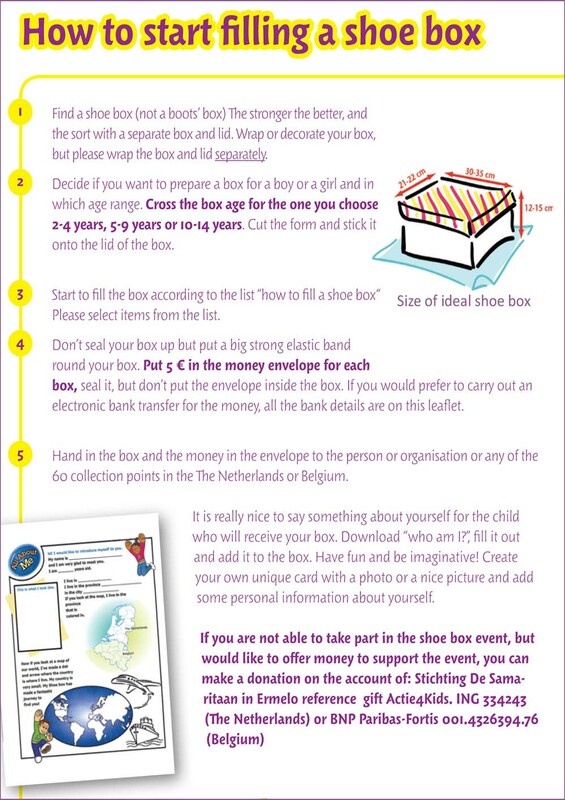 Actie4Kids, have prepared a very comprehensive brochure which explains how a Shoe Box may be packed and wrapped with guidance about content for boys and girls of different age groups. This brochure may be printed or read on the screen. As the type is very small in places, use the magnifying facility to enlarge for reading on the screen. Because of this difficulty most of the information in the brochure is dispayed below. 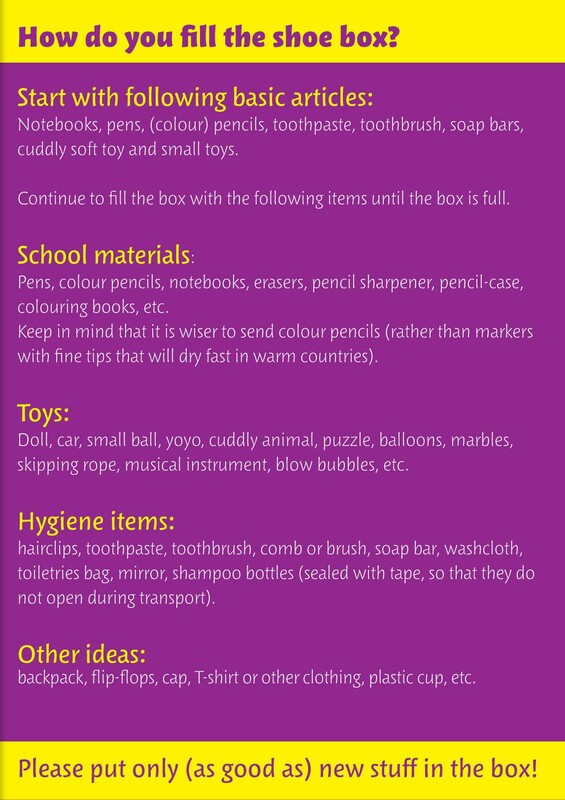 Actie4Kids, have arranged several Pick-UP points in Belgium with 2 in the region of Brussels. Pick-Up Date: Deliver after making an appointment from 21 until 25 november 2011. 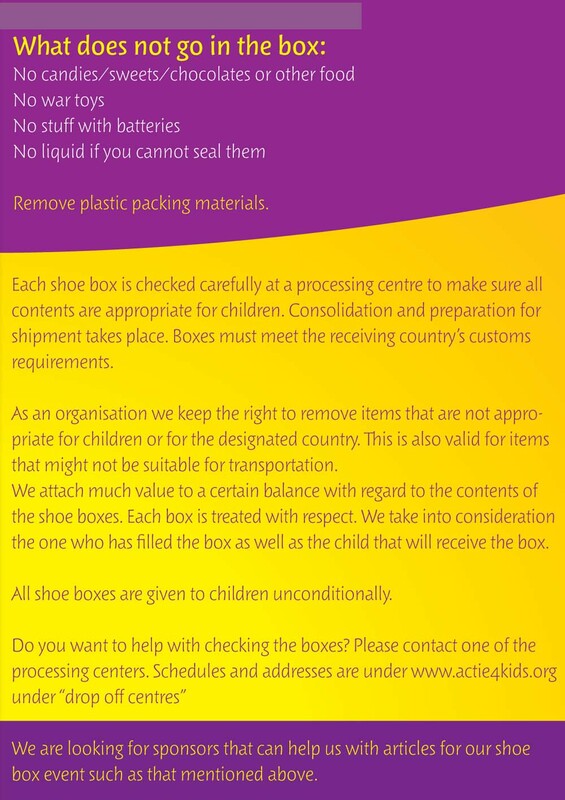 Max 10 boxes may be delivered at reception between 8.30 en 15.30h. For more boxes please make an appointment with Heidi Bowcher by mail or mobile phone. The panels below may be enlarged where difficult to read by clicking on image 2 times. The enlarged image may be copied or ‘saved as…’ if required.